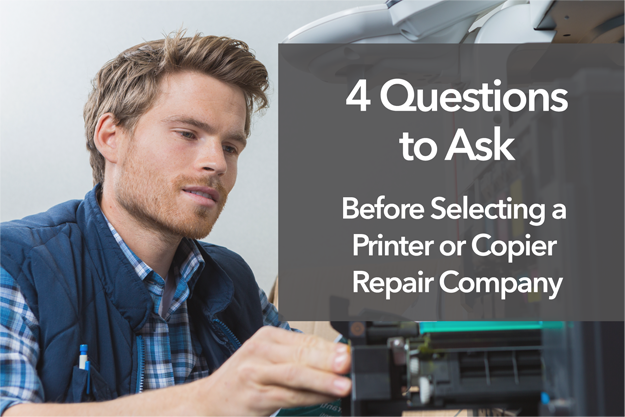 When you are tasked with finding the best company to service your office equipment, what should you look for and what questions should you ask, before you commit to a service call? This can be a difficult task. When dealing with a service company, you must be certain that they are honest and have your best interest in mind. I am a strong believer in references. Any company can talk about how great they are. However, it takes honesty, hard work, and exceptional service to maintain a long-term client. Any prospective company should be able to provide a list of clients they have serviced for over 5 years, who are willing to provide a testimonial. Your next question should be, do they use new or remanufactured parts in their repairs? I would advise letting them make this choice for you as long as they have a good warranty and are willing to back their recommendations. We will discuss warranty in the next paragraph. There are many times when a remanufactured part is as good as new, and this can save you a lot in repair costs. An experienced company should be able to advise in this area. I always tell my customers that if you save 50% on the cost of a part and it only lasts half as long, you have saved nothing. Furthermore, a bad decision will create more downtime, more service calls and more headache for you. Warranty is the most important part of your repair. A reputable company should be willing to back their repairs with a substantial warranty for both parts and labor. If a company tells you a remanufactured or rebuilt part is as good as new, they should be willing to warranty it like new. This usually means the warranty should be for at least 50% of the manufacturer’s duty cycle. Laser Age backs all of our repairs with a warranty that will make you confident in the repair and our technicians’ recommendations. Lastly, cost should be considered before you commit to a service call. Make sure you know what you are getting into. A reputable company should be willing to commit to a flat rate, which will not be exceeded, to come on site and diagnose your problem. This will enable them to diagnose your problem and give you an exact quote for the cost to repair your machine. You don’t want to get a large service bill for a machine which the technician decides it can’t be repaired. Laser Age provides free on-site diagnostics for our customers, so you never end up in this position.